Phonographic Copyright (p) – Cat Productions Ltd. Copyright (c) – Cat Productions Ltd. Newspaper on front album cover originally was a copy of the infamous "Dewey defeats Truman" issue of the Chicago Tribune. After the Chicago Tribune objected to the inclusion, the cover was changed to read "Dewei defeats Truman". The billboards in the distance were originally Coca-Cola adverts, but were changed to the names of the band members due to the objections of Coca-Cola. The waving man on the front cover is Hugh Syme, who was the cover designer, and also played piano on 'Different Strings'. Released with lyrics and band photos on inner sleeve. Matrix / Runout (Side A [variant 1]): ANR-1-1021-A(2) TRIDENT U.K.
Matrix / Runout (Side A [variant 3]): ANR-1-1021-A TRIDENT U.K.
Matrix / Runout (Side A [variant 5]): ANR-1-1021-A② TRIDENT U.K.
HA .... i just realized i have this particular pressing ! (bought when i was a young teen) cut by ray staff ! it always sounded great, and now i know why ! Initially, I barely listened to this album compared to Signals, Moving Pictures and Grace Under Pressure. Only recently did I realize the power this album has. I'd even go as far as to say this is better than Moving Pictures (if it weren't for *cough*Different Strings*cough*, but the album is good as a whole) One thing that this album has over many of the Rush's other albums is one word. Alex. That's all. This album has probably the best damn solos he has constructed–sure, he has them on every album, but not this frequently. The album does give on a transitional feeling in that synth is much more prevalent on this album. Entre Nous: We return with the second side of the LP. Now this is a more radio-friendly song like Spirit of. The best part has to be Peart's drumming and cymbal tapping. This song is a good listen, but is practically separated from the rest of the album by its style and delivery. 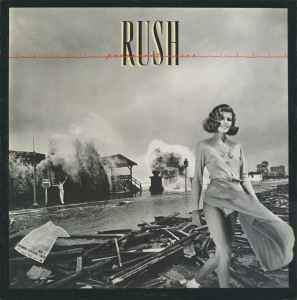 Permanent Waves is a classic Rush album and is up there with their more well known albums. For me, and probably most Rushgoers, I know that this album never gets old listening to once you take a liking to it. 5 stars.